Let’s meet at Microsoft Tech Summit 2018! Another great event for Azure and Office 365 enthusiasts is just around the corner. Starting from tomorrow, we will exhibit at Microsoft Tech Summit in Amsterdam (the Netherlands). The event takes place between March 28th and March 29th, 2018. If you happen to be there, make sure to meet us! 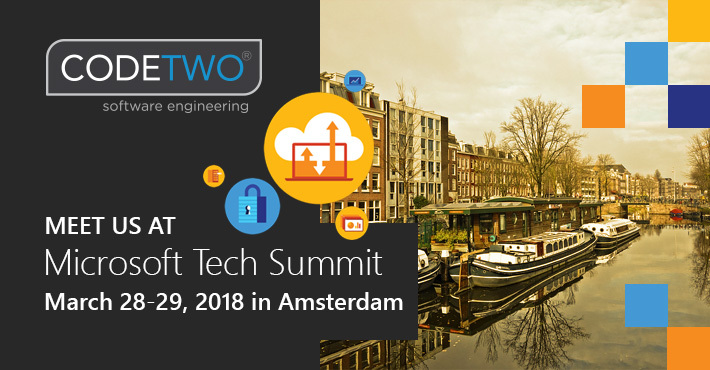 Microsoft Tech Summit is a perfect place for IT pros who want to learn more from top cloud experts and share their experience with other community members. During this two-day event, the attendees will have the opportunity to improve their skills in Azure and Microsoft 365, learn about the latest trends and develop their cloud expertise. No matter what your skills are, you will definitely benefit from this learning event. We will be there to present our solutions for Office 365 email signatures, email backup, and Office 365 migration. Make sure to stop by our booth and say ‘Hi’. We can’t wait to exchange thoughts on Azure and Office 365 with other cloud fans. Visit Microsoft Tech Summit website for more details. Can’t be there? See other events we are attending this year.